A subtle ice that’s smooth, even without an ice-cream machine. Straining mild, natural yogurt to expel excess water takes a few extra hours – if you can’t spare the time, use 600g full-fat Greek yogurt and don’t strain. 1. Line a large sieve with muslin or a single layer of kitchen paper and set over a large bowl. Spoon in the yogurt, then leave in the fridge overnight to strain. 2. Scoop the pulp from 4 passion fruit into a bowl. Whisk in the honey, lime juice and a pinch of salt, then add the strained yogurt and whisk to combine. 3. Churn in an ice-cream machine according to manufacturer’s instructions, until the blade begins to stop. Transfer to a freezeproof container, cover and freeze for at least 4 hours, or overnight, until set. If you don’t have a machine, tip the mixture into a shallow, wide container and freeze for 2 hours, until the edges freeze. Break up the borders with a fork and combine with the unfrozen middle. Return to the freezer, repeating this process every hour, for 3 hours, or until it’s too stiff to mix. Cover and freeze again, undisturbed, for 4 hours or overnight. 4. Allow the yogurt to soften in the fridge for 5 minutes before scooping. 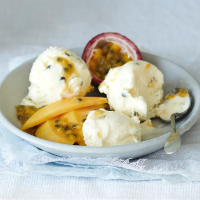 Serve with the mango slices, spooning the remaining passion fruit pulp over the top.